At Go Modern we get very excited when Novamobili Italy launches a new collection. They make the kind of furniture we love: stylish and modern, big on function and swoon-worthy on the looks front. And they’re especially good at bedroom furniture. Their beds always include great ideas such as clever storage, beautifully upholstered finishes, generous padding and elegant detailing. So, we’re thrilled to announce the UK launch of some of Novamobili’s latest upholstered beds, including Modo, Brick, and Margot. And you’ll be spoilt for choice when it comes to fabrics – there’s a choice of 120, including 24 in leather or eco-leather. The very handsome Margot, above, was designed in-house by the Novamobili Studio team. What we love most is its low-key, elegance – a kind of ‘Kate Moss’ of the bed world. And, as well as the generously padded frame and headboard (OK – so after low-key elegance, the resemblance to Kate Moss goes no further) look at the extra design details such as some slightly quirky, angled metal legs. Fab! There are also two different heights to choose from for the mattress: flush with the bed or set 7cm below the top of the base frame. Did we mention that it’s all in the detail! 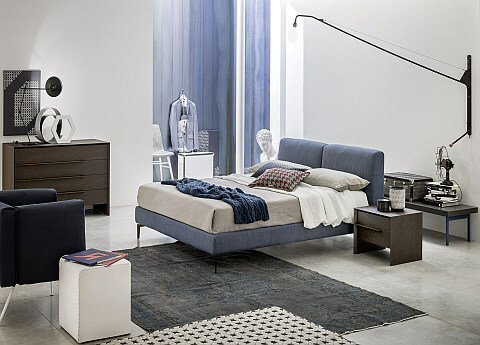 Studio Gherardi are the designers behind Brick, with its luxurious and deep upholstered headboard and frame. Look out for the tailor-quality stitching too, which can be chosen in pinch or standard style to match the fabric, or blanket stitching in contrasting shades if you want to add a personal touch or your own quirky finish. As with Margot, there’s a choice of two heights for the mattress, flush or set 10cm below the frame, and it’s also available as a storage bed with a wonderfully roomy base. Designed in-house by the Novamobili Studio team, Modo is the quietly chic member of the collection. The stand-out feature for us is its deeply padded headboard with some very neat, central, buttonless top-stitching, creating an air of relaxed sophistication. The generously upholstered, curved base is also available with two types of storage: ‘simple’ which allows the whole base to be lifted, giving you easy access from three sides, or ‘standard’ which lifts from the end of the bed. Which style you chose obviously depends on the size of your bedroom and what other furniture you have around the bed. So, we hope you like Novamobili’s latest designs as much as we do. And borrowing from one of our greatest plays about the world of slumber: “Take pains. Be perfect.” We think Novamobili have done just that! Pop over to the Go Modern site and take a look at all of our upholstered bed collection… Sweet Dreams! PS – and of course we also have a great mid-summer sale on at the moment! Next PostNext Fitted, hinged, sliding door or walk-in wardrobes – our guide to what you need to know!